Yup. I've seen the clip. Wheee. This looks good. Much better than the first stuff, much more promising. 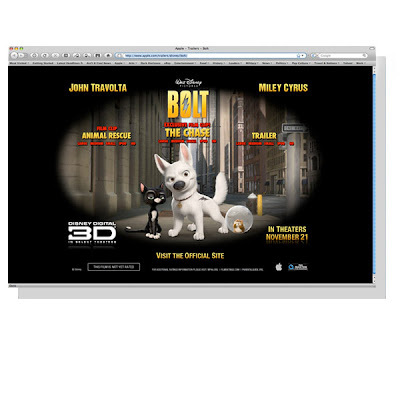 I think I'm going to really enjoy Bolt. Especially in digital 3d. Boy, that looks great. It has John Lasseter all over it...and a little Brad Bird for good measure. Not to say the Disney guys, actually doing the work, don't have their amazingly talented prints all over the film as well. It's hard to pinpoint, but it just has that "going the extra mile", feel. Kudos to everyone at Disney.